Build-in pattern lock tool is useful for adding an extra layer of security to your Android smartphone. What happen if you forgot your pattern and want to know how to unlock android phone or tablet? Pattern lock is very important for those who have sensitive data or have personal files in their android devices. This will help you to prevent your device from unauthorized use but the trouble starts when you forget it. By yourself or by anyone your phone got locked after many pattern attempts? Resolve it here. After too many attempts you need to keep your device apart timer will starts to count cycles. Once timer completes time cycles try again with remembered password. Still you are unable to unlock pattern lock or Want to get instant access see next method which might be useful to you. In this tutorial will show you how to unlock and reset your android device lock pattern if you have forgotten your lock patter. Just follow these simple steps to unlock your phone and use again free of cost. Use the volume key to move up and down then scroll down to “Restore Factory Defaults” or “Delete all User Data” depending on which is on your device. After clicking on the settings above, now scroll down to “Reboot System Now ” and wait for your phone to reboot. Important: This method deletes all your data and apps. In step 2 of this method we use three keys Volume up, power and home. But in some phones home is not available so you can press Volume up and down with power button. Here we are not going to tell you all combination of buttons for factory reset. So you can search for your specified android smartphone or tablet. In this case to unlock android pattern lock you will be using your gmail credentials registered with google play store. If you chosen this method you need to have some knowledge on Android Settings Navigation. Proceed at your own Risk. 1st Download Aroma File Manager: Click here! Download Aroma File Manager and Store into the Memory card. Soon you did it place this memory card in locked Smartphone. Now Boot into “Recovery mode” ie by pressing and holding Volume Up Button and Power button simultaneously. In some mobiles third button Volume Down is also required to hold. After this Use “Volume up” and “Volume down” keys to navigate and “Power button” to Select. Select “Install Zip from SD Card” which lets you to install Aroma File Manager from SD card. After Installing you will be in recovery mode. Now navigate to Settings from Aroma manager and click on “Automount all devices on start” which is at bottom and exit. Again you will be taken to recovery mode select again “Install Zip from SD Card”. Now navigate to Data Folder –>>System Folder — >> “gesture.key” or “password.key”. Delete the file and then exit aroma file manager and reboot your android device. Now you will be asked to draw pattern don’t panic draw any pattern and your android device will open and remember that pattern for further attempts. 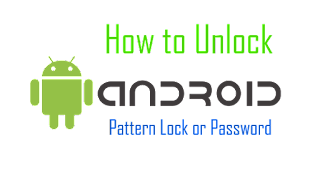 These are the Best suitable methods Preferred to Unlock Android Pattern Lock on any Android Devices. Share this article on your social networks whether it was useful.